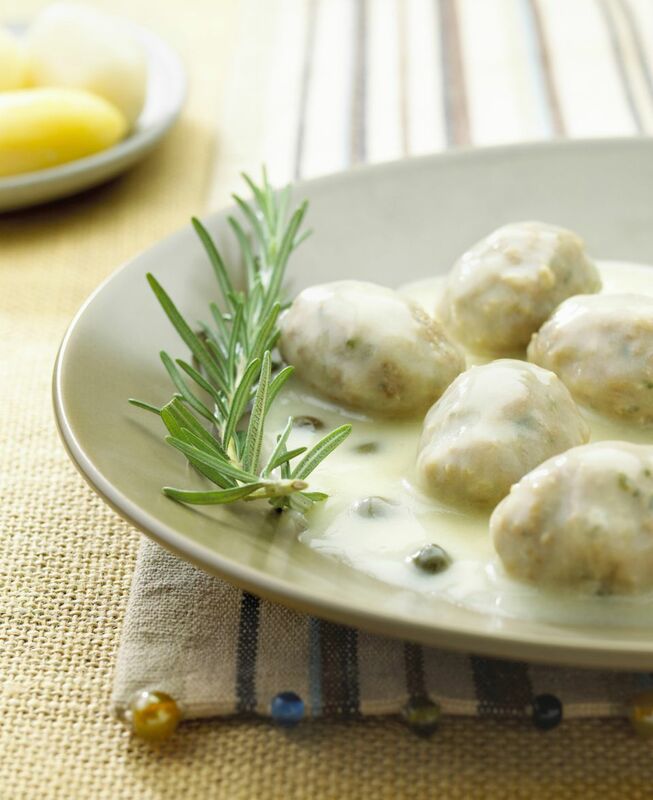 This recipe for meatballs in white sauce or königsberger klopse is actually meatballs (klopse) prepared in the style of Königsberg. Until 1946, Königsberg was a city in East Prussia (now Poland) that was once part of Germany. This Prussian specialty is now prepared throughout Germany. It is flavored with capers and lemon juice and served with potatoes and pickled beets. Note that German ground meat recipes usually are made with a combination of at least two different meats. Most often it is pork and beef, but it can include ground veal or lamb, or sometimes fish. Soak the day-old in water and squeeze almost dry. Melt 1 tablespoon of the butter and cook the finely chopped onion until translucent. Cool slightly. In a large bowl, place the pork and beef, cooked onions, soaked and squeezed bread broken into pieces. Add 1 egg yolk, salt, and pepper and mix well. If mixture can't be formed into meatballs, add a few tablespoons broth. Form into 12 meatballs. In a large saucepan, bring the rest of the broth, cracked peppercorns, optional cracked juniper berries, optional bay leaf and quartered onion to just under a boil. Add the meatballs carefully. Cook until done, about 12 minutes. Remove meatballs and keep warm. Melt 2 tablespoons butter in a pan and add the flour, making a roux. Slowly, stir about 1 1/2 cups of the strained meatball cooking liquid into the roux, whisking to keep the sauce smooth. Add the capers and white wine, and season the sauce to taste with lemon juice, sour cream, and the optional pinch of sugar. Add the meatballs to the sauce, warm through and serve.